Boy am I tired! 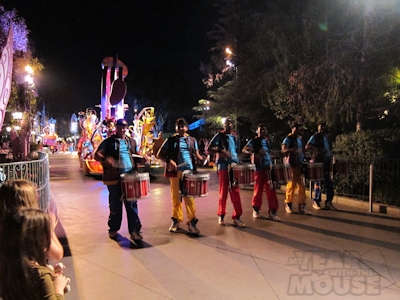 Last night we went to the special Annual Passholder Soundsational Parade event. It was an RSVP-only event held after park hours from 8pm to Midnight. 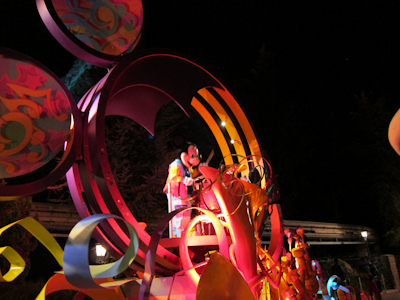 The highlight was our very own viewing of the Soundsational Parade. 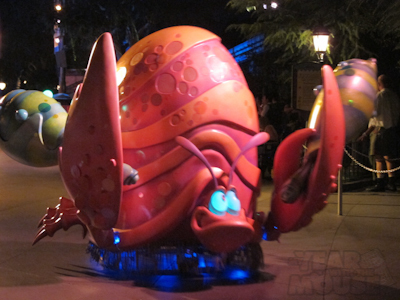 Most of the Fantasyland and Tomorrowland attractions were open (except Autopia) and four of the restaurants offered a special Soundsational treat only to those with Soundsational wristbands. The treat at the Refreshment Corner was a hot dog, the one at Blue Ribbon Bakery was a pumpkin muffin, and there were also ones at Tomorrowland Terrace and Redd Rockett’s Pizza Port that we didn’t get to. 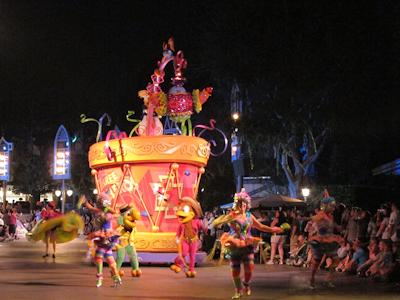 The highlight, aside from only having less than 5,000 people in the park, was the Soundsational Parade. 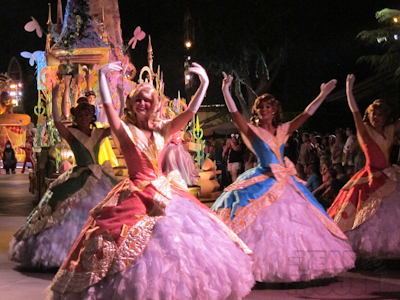 Soundsational is Disneyland’s newest parade, just opening this summer. I’ve already seen it (twice, actually) but Kevin and Theo hadn’t, so the AP night was the perfect opportunity. And let me tell you ladies and gentlemice, I thought the parade was fantastic in the sunlight? It is absolutely stunning at night. S.T.U.N.N.I.N.G. 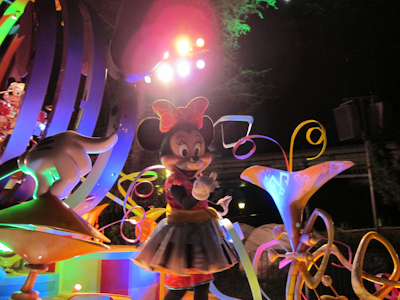 The lights, colors, and music are really amazing, vivid, and enchanting. 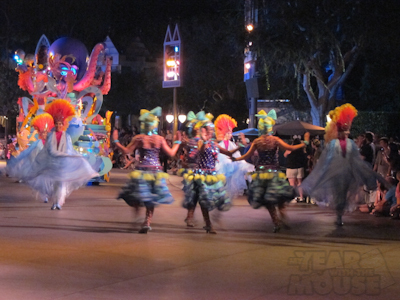 There are nine floats and each float is preceded by a group of dancers and often followed by a comedy hangers-on. We got this prime parade seating right by Alice approximately 5 minutes before the parade started. 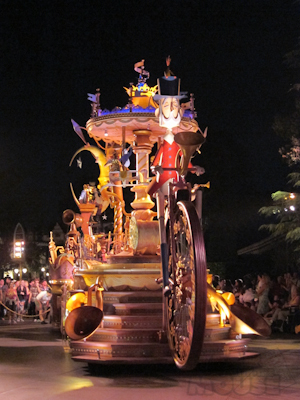 If you’ve ever waited for a parade at Disneyland, you’ll understand how remarkable this is. 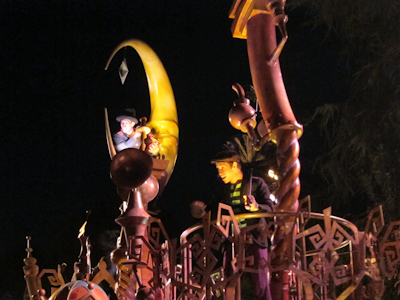 And incidentally, the best places to watch the parades in my opinion are back toward Small World. You don’t have to stake your spot out hours in advance and it’s the same parade that goes right through Main Street where people DO wait. 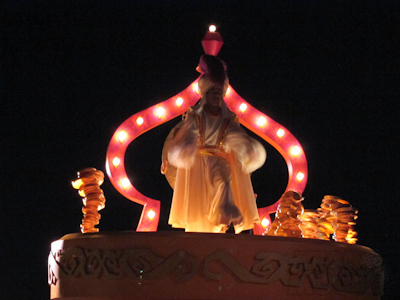 The float itself is emblematic of what they all look like. The word “kinetic” comes to mind. I’m not sure why, since I don’t 100% know the meaning of that word, but it seems like it should apply. Plus it makes me sound pretentious. And who doesn't love a pretentious blogger? Mickey and Minnie were onboard being all musical and stuff. Theo loved that part. 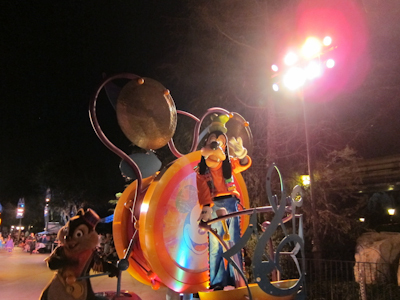 The drum and cymbals are Mickey shaped! Chip and Dale danced along with him. 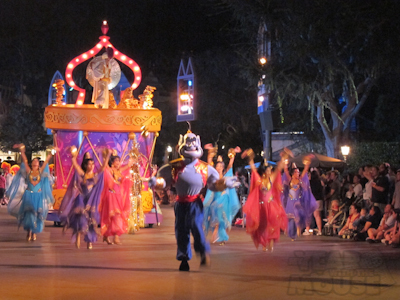 Next came Aladdin with his dancers. Check out that fabulous color!!! 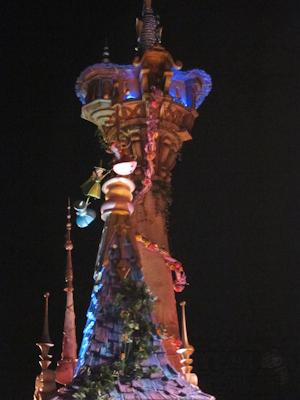 Aladdin is up on top with his riches. Looks kind of like Vegas! 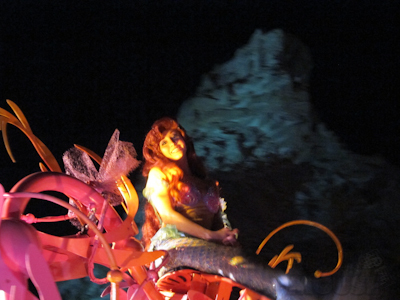 Ariel’s float was also… (lemme think of another pretentious word)… radiant! He stopped and talked to us. I swear to god, with his eyes! 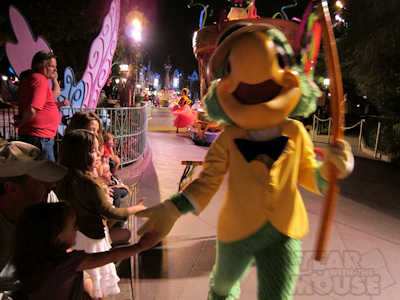 The characters were all really great at reaching over and giving high fives to the kids in our little section. Now I’ll just take a moment here and say that I think I enjoyed the parade so much more at night and from this spot because it wasn’t polluted with a bunch of visual noise (how’s THAT for pretentious???). 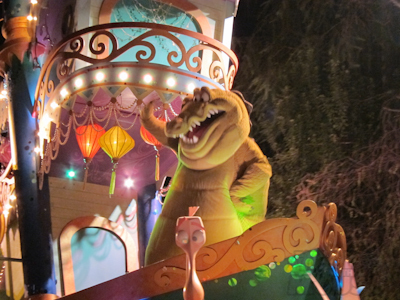 I mean, usually the surrounding area is also full of color and movement and traffic, particularly on Main Street, but from both our vantage point (which I’m becoming more and more a fan of) and the fact that it was dark made the floats really stand out. The princess coterie (pretentious!) looked like they just came from court. Can you imagine trying to slow-dance at prom in one of those dresses? 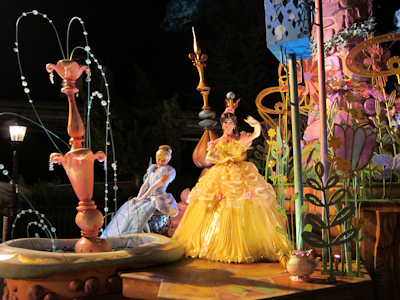 And here was another favorite part of mine–the many princesses in one float. Five on this one to be exact. For those of us who aren’t completely into princesses, it is nice to see them sort of bunched together rather than all on their separate floats. Now you're asking "How do I get my own special picture on MYWTM?" 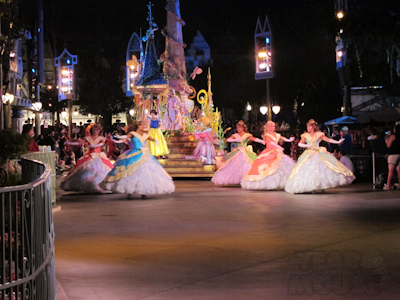 And just when you thought the princesses were all done, there’s Cinderella and Belle on the back! Belle says "I'd rather be sitting"
The Lion King came next. It had a group of dancing acrobatic monkeys first. Doesn’t that sound cool? Unfortunately, they were human. 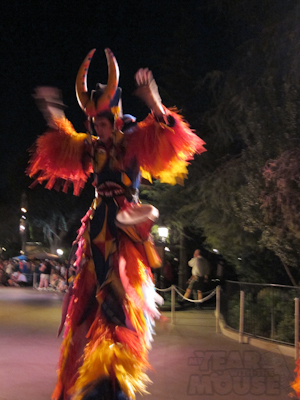 The Lion King float also had very cool dancers on stilts. See what I mean about the colors? 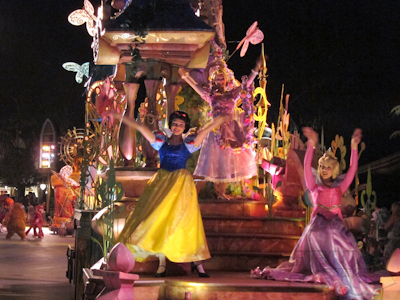 How come they never bring out the stilts for the princess floats? The Princess and the Frog came next. There was an awesome group of flappers-style dancers. It was hard to take a picture since they were all, you know, dancing, but I did get this one. And at first I thought it was an AWESOME PHOTOGRAPHER shot but now I think it’s actually really cool. 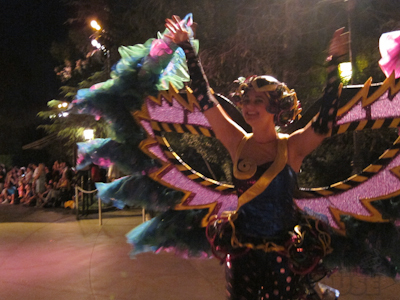 There were also dancing masquerade masks, which were just gorgeous. "And what do you do?" "I'm a mask in a parade"
Not quite centered there. 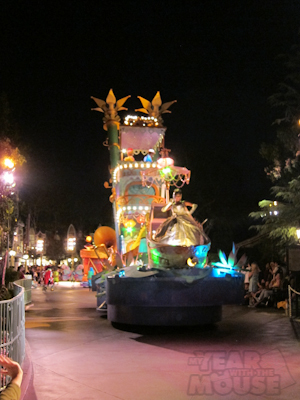 Tiana’s float was also really beautiful and a good example of what I mean by how much better it looked in the dark. Tinkerbell came next. 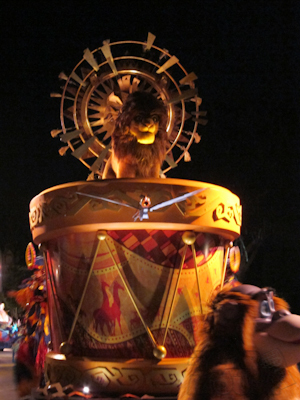 Given her current popularity, I was actually kind of surprised by how low-key her float–I mean drum–looked. Smee and the other pirates, Captain Hook, and Peter Pan all danced along ahead. Why is Smee like twice the size of Captain Hook? 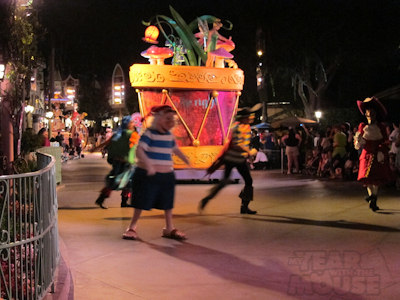 I was too busy enjoying Peter Pan’s antics with our little group to take a picture of Tink. 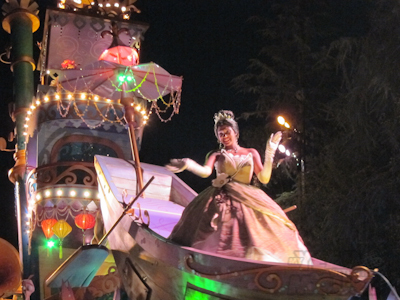 The last float was from Mary Poppins. There were difficult-to-photograph chimney sweeps, like a chimney sweep drill team, and then Mary and Bert came along on these little mini-floats like carousel horses that actually went up and down. 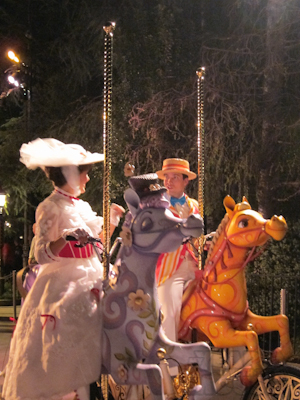 "It's a Jolly Holiday!" "I know, right???" As you can see, the parade was just gorgeous. I highly recommend watching it at night if you can, or watching it from the vantage point of the least amount of visual noise. It really was stunning. How funny that you walked right past us! I’m glad you enjoyed the parade as much as we did. Were the Soundsational Treats really free? I didn’t know that! 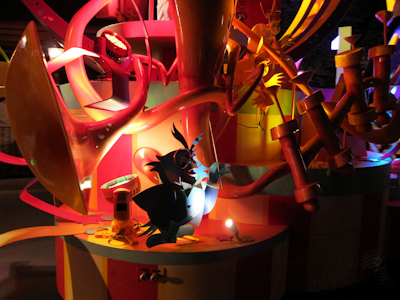 I believe that the owl on the side of the Mickey float is Professor Owl from the Sing Along DVDs. 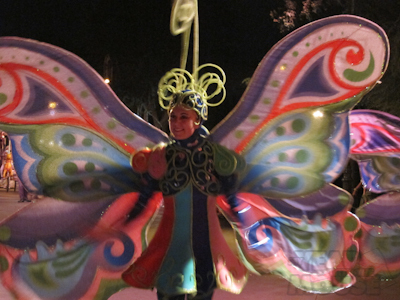 We have the Disneyland Fun DVD and my daughter (age 2) always begs (owl, owl, owl…) every time the DVD gets to the end. 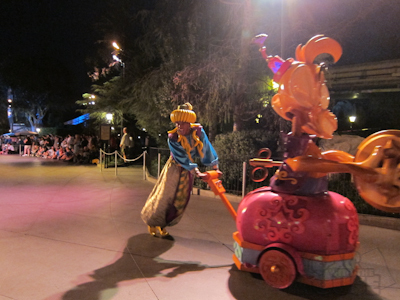 Oh, that makes sense given that it’s the SOUNDsational parade! Thanks! That parrot is José Carioca from The Three Caballeros and also from The Enchanted Tiki Room. Frankly, i have always found parrots with their grossly over-sized beaks to be somewhat scary. Hunh, I didn’t realize that the Jose in the Tiki Room is the same as the parrot in the Three Caballaros. I also find them a bit creepy. It was an awesome event and the parade floats were gorgeous! I’m actually not usually to into the parades but this one was really good. The princess float was definitely my dd’s favorite. Walking on to star tours, buzz, dumbo, rockets,etc was also pretty great! 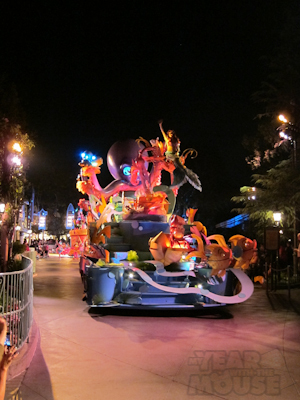 Did you stick around for any of the float photo ops at the end? the lines were long but moved really fast. We caught some of the photo ops at the end and it was great getting a close-up look, but the characters weren’t out yet and Theo was d.o.n.e for the night so we went home. I’m not usually one who gets into parades either, but this was so amazing. Looks good in the dark. We saw the parade this summer. We saw part of it again in September while waiting in line (and then riding) Alice. Kinesthetics has to do with movement, so I’d say it fits pretty well. My husband’s degree is in Kinesiology, which is basically the study of how the body moves (throught different ages). We talk about kinesthetics as teachers because some kids learn better when they move and interact. 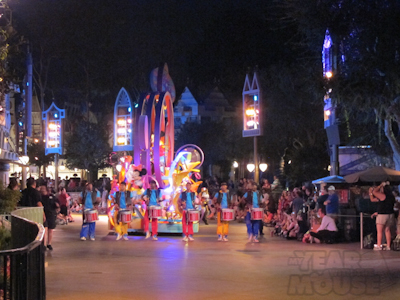 This is my first comment though I have been enjoying reading for a while now…I have to completely agree that the best place to watch parades is by Small World. Growing up, that is where my family would stake a claim for the Electric Light Parade. You watched the parade as it entered the park and then were done before anyone else and got to go enjoy rides while folks were still waiting for the parade to reach them. Way better than waiting on Main Street for hours. Thanks for the first comment! 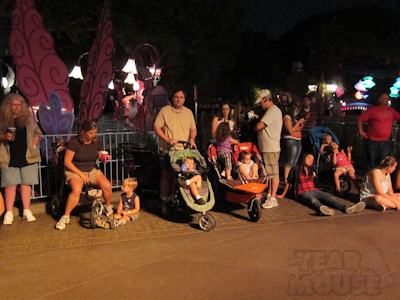 The bonus too, as you pointed out, is that while everyone else is waiting on Main Street, the Fantasyland rides are often not crowded at all! We (husband & I) saw this last month and we thought it was a great parade. Being that it was his first time in Disneyland, I’m happy he was up for watching it. He did not know that Mary Poppins was a Disney movie. 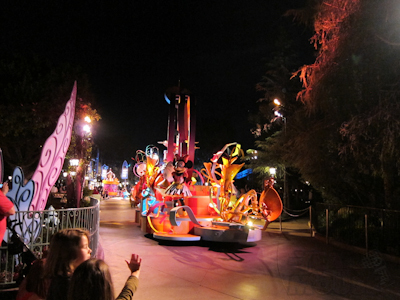 We were actually near the huge Mickey pumpkin in front to watch it, and after the ropes came by, we left and headed to MouseNextDoor to watch World of Color. Yup, the owl is the guy that hosts all of Disney’s Sing-Along-Songs! My sister had one of the VHS tapes. I *think* he might also be from the old TV show, because her tape had a song that was a clip from the old TV show hosted by Walt that featured the owl as a professor (his debut, mayhap?). You were in marching band too?????? Yep, I played the flag! (Colorguard ;)) My talent knows no end. 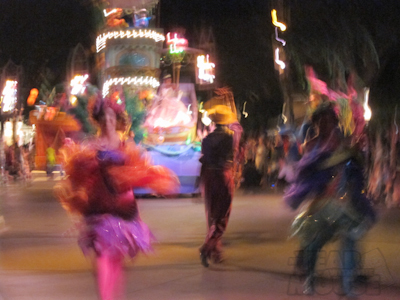 Oh, even better–as part of a marching band in a Southern California high school, I actually marched in DISNEYLAND down Main Street, back when they allowed visiting band to do that. They wouldn’t let us twirl our flags though, lest we accidentally bean someone.